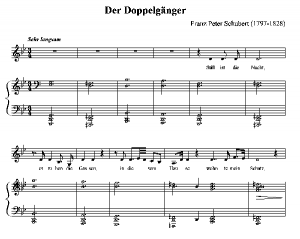 I first encountered Schubert’s Der Doppelgänger in college, right at the beginning of my vocal studies. Immediately I knew I was handling fire. The poetry spoke to me very directly, and once I knew the contours of Schubert’s accompaniment I was awestruck. I know it is one of the songs I will sing for the rest of my life. Despite my intense love of the piece, my first performances of it were rather lukewarm. The high notes cracked, the low notes were little more than whispers, my face was cramping by the end of the song, having gesticulated the best sadness I thought I could convey with my eyebrows. My poor little Schatzie had left me. At the time, I only acknowledged that much of the message in the poetry, and it seemed a poem of love lost and mourned, with a general affect of melancholy. After seven years with the piece my relationship to it has naturally grown, and now I will attempt to describe my subtext as it is today. I do not intend to rigorously analyze the piece harmonically, rather give a sense of how I see the music informing the delivery of the text, and revealing the inner state of the poem’s speaker. Any mention of the score will refer to the transposition for bass, in g-minor. There is a game that some of the late-night talk show hosts play at the beginning of the show to waste time getting laughs in which the audience is shown a very abstract picture. In a series of a few frames, the zoom is slowly removed so that what seemed amorphous and strange is beheld as it actually is, commonplace and easily recognizable. In a similar but reverse fashion, this song takes a situation that at the start is clear and understandable and zooms in to a point where the center cannot hold, and spins out again. The piano sneaks in on empty chords. Both hands are in the bass clef for the entire song, and the low sonority takes us down into low, dark places of the speaker’s consciousness. The missing third in the tonic chords creates hollowness, compulsion. The scene opens on a dark street, void of people. The speaker’s feet have brought him here, once again, to behold the house where his past lover lives no longer. The accompaniment mimics the vocal line twice, as the speaker mentions first his former lover, then the fact that the house remains in the same square. These repetitions are of a dwelling mind, and hints at the obsessive quality with which the speaker has been saying goodbye to his relationship. Then, he begins to have an out-of-body experience. At first, it seems as if the speaker is apprehending another dark figure in the street. There is a man, standing alone, ringing his hands and staring into the sky. The music crescendos, as the speaker realizes the figure is very unsettling. Just as the speaker recognizes the Schmerzensgewalt, the bitter pain, that this figure is enduring the piano signals the first major epiphany of the piece with afortississimo chord. This chord should be played with all possible force on the keys and literally shake the piano—it is the truth trying to break free, almost too much. It is interesting to note that the triple-forte chord comes a beat before the “Schmerzensgewalt.” The piano quickly withdraws into the shadows again as the speaker tries to objectify this strange, pained man—”mir graust es, it horrifies me.” Yet the long crescendo draws the speaker inevitably towards his second epiphany. The second fortississimo chord occurs right as he says “meine eigne Gestalt.” The confluence of this chord and this syllable are of utmost importance, since it is a lining-up of sorts of the speaker’s powers of perception. He at once beholds his own form and sees into the heart of his obsession, into the heart of his pain, and takes ownership of his own lot for a moment. In a way he looks backwards through his own eyes, if only briefly. Contrasted with the empty, almost habitually torturous way the speaker entered the scene, this outburst of powerful revelation seems drastic. If there is any moment in the song, whether poetic or harmonic, to find a new direction, then this is it. But for any number of reasons the moment passes. The speaker once again objectifies his own gestalt, calling it this time a Doppelganger, a phantom-double, which apes the pain that has tortured him in this place. There is quite a lot of anger in the music, flaring up chromatically into b-minor. There are now two measures of triple-forte, two chords transitioning back into an extended cadence in g-minor, decreasing to piano. The speaker’s final words “so manche Nacht, in alter Zeit? (so many nights, in another time)” draw him back helplessly into the past, and the energy surge is ended. For now, he is still doomed to repeat this unnerving scene, as the piano gives us again the original progression in g-minor, yet with an important difference. The third is now included in the tonic chord, and rounds out the harmony. Perhaps the speaker now feels a little bit more of his own grief. Will this be an ultimately redemptive process? Schubert delivers us into a sublime g-major cadence at the end of the piece, yet it is inconclusive what, exactly, it means. If the piece is viewed as a series of dynamic peaks and valleys, then it begins very softly, rises to triple forte three times to punctuate the words “Schmerzensgewalt”, “Gestalt”, and the transition back into reminiscent pain on “so manche Nacht”, and then softly exitspianississimo in major mode. Perhaps the speaker finds a restful mind at the end of the song, or perhaps Schubert himself is blessing this process of grief. What is left is to investigate for oneself what motivates this process of recursion into the past and the grief it causes the speaker of the poem, and ourselves. Next: Is a Career as an Orchestral String Player Realistic?